Enjoy a guided horseback ride through beautiful nature trails. 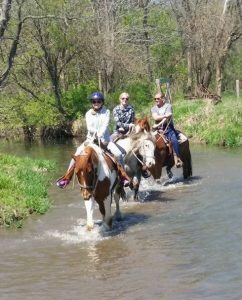 Trail rides – $35 per rider ages 7 and above. Ride time is 50 – 70 minutes long. Tour times are 11:00, 12:30, and 2:00 every day. 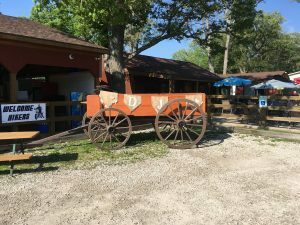 Controlled rides – $15 per rider ages 6 and under. Rider is led by wrangler staff around the stable area of the ranch. Anyone under 18 yrs old must wear a helmet. All minors under the age of 10 are required to have an adult on a trail ride with them. All riders under 18 must have parental consent in order to ride. Go to the Release of Liability section and complete the form. Open year round. Weather permitting. Cancellation Policy: For a full refund, cancel at least 24 hours in advance of your scheduled ride time. 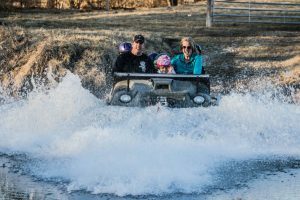 Enjoy a guided motorized amphibious tour experiencing the history, animals and nature on Cedar Creek Ranch. Ride time 45 minutes. $30 per rider ages 7 and above. $15 per rider ages 6 and under. 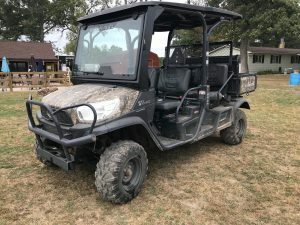 Ride along with the trail horses in a guided motorized vehicle experiencing the history, animals and nature on Cedar Creek Ranch. $20 per rider ages 7 and above. 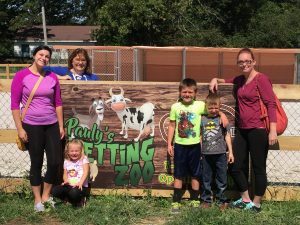 Get up close and friendly with the unique farm animals who live on Cedar Creek Ranch. Dinner cooked in cast iron pans over an open fire. Acoustic guitar and campfire songs. Enjoy outdoor dining in the woods. Book for company outings, family reunions, outdoor parties, birthdays, bachelor/bachelor parties. We offer boarding both short and long term. Due to rising costs, a surcharge of 3.99% will be added to every credit card payment. There is no surcharge for all cash payments. All displayed, posted, or advertised prices at this location are the cash sale price.